Two Times A Lady, an action-adventure screenplay penned by the duo, features an American national security agent who dodges death to save a young American woman from corrupt officials who target her in a case of mistaken identity to take the fall for a violent revolutionary leader in Mexico. This screenplay placed in the finals of Telluride IndieFest; America's Best, a screenplay competition sponsored by The Writer's Foundation; Southwest Writers Workshop; the Lone Star Screenplay Competition; and received honorable mention in the The Writer's Network Screenplay and Fiction Competition. Judges of the Lone Star Screenplay Competition commented that "talent, style and excellence distinguishes this script as one of the very outstanding submissions to the competition." Long Road To Heaven, a feature-length drama steeped in suspense, presents simple-minded Willy, abandoned by his father at birth and merrily drifting through life until the questionable demise of his best and only friend Tom, a gentle-natured black man who sees past the boy’s obvious shortcomings. While Willy struggles to understand the tragedy, townsfolk in sleepy little Harveyville scarcely raise an eyebrow. Befriended by the Deputy assigned to see that the death was “accidental,” Willy adopts the lawman as his new friend and tries hard to please him. Guided only by the memory of Tom’s wisdom, Willy soon discovers the Deputy’s duplicitous nature and confronts him with the truth in a challenge that could cost him his life and that of his long lost father. This screenplay was selected as a semi-finalist in the Writer's Network Screenplay & Fiction Competition against 1700 entries and rose to the top ten percent of the Nicholl Fellowships in Screenwriting out of more than 6000 entries. 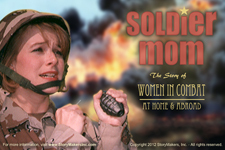 Soldier Mom, an award-winning stage play, written, produced, and directed by StoryMakers, received Honorable Mention from Writer's Digest Magazine Writing Competition and garnered the authors recognition from the American Gulf War Veterans Association for their authentic representation of life for American soldiers who served in the Gulf War. Stage play available for production by qualified theatrical companies and organizations! Contact Us regarding production of this stage play. 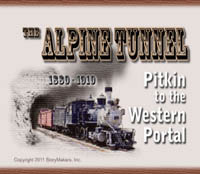 The Alpine Tunnel: Pitkin to the Western Portal takes you on a thrilling and informative ride along the old narrow gauge railroad grade which climbs up from Pitkin, Colorado, to the western portal of the first railroad tunnel to pierce the Continental Divide. This section of the South Park, Pacific Railroad took 18 months to construct beginning in 1880. This project is on hold pending approval for use of copyrighted archival images. 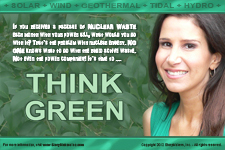 Think Green features Houston actress Renee Edd in a thought-provoking look at the problem with generating electricity from nuclear energy. Posters are available. Cell Phones & Driving: When Not to Take That Call offers solid reasons why it is in your best interest to keep your attention on the road when you are behing the wheel. This video was recognized for its effectiveness by the Southern Gas Association (SGA) and is also posted on the SGA web site. What Can She Teach You About The Flu? employs a slightly irreverent approach to a very serious health issue.